Formerly known as Coursekit, Lore is an online educational tool meant for the connection of students and instructors in one well designed and easy to use community. Lore was launched in November 2011, and is already used for courses in over 600 universities, making it a quickly growing competitor to the unfortunately popular Blackboard. The unique aspect about Lore is the simple design and the social facet of the site that allows more casual communication between the instructor and the learner. Before yesterday, Lore was only open to students who were invited by their professors who were using Lore for their courses. 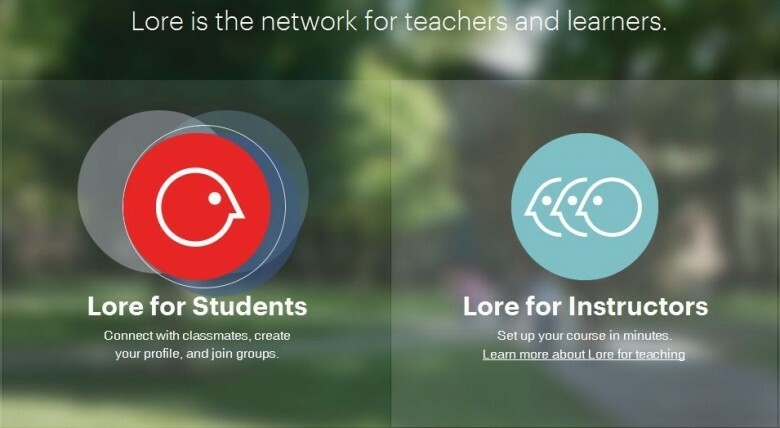 However, Lore has now launched its student social networking part of the site, allowing students everywhere to become apart of the system. This new student social network is different from other “social” networks, because it is more of an “educational” network. For example, where Facebook is literally about people’s social lives and interactions with “friends,” Lore is about student’s educational lives and is based around the school that they attend and their interactions with students and professors. This social network is directly integrated with the user’s school, requires a student email to create, and is focused on maintaining and keeping track of connections and experiences that were originally made on campus. Because Lore is primarily based on one’s school, it gives students a better opportunity to talk to other students who they would normally not connect with on other social networks. Students using Lore are able to contact and connect with other students who they currently share a class with, are in a study group with, are in a club with, etc. From there, users can create posts about school, education related items, information about class assignments, helpful links that pertain to a certain subject, and so on. Lore also gives students the option to non-awkwardly follow their professors without having to worry about these professors seeing embarrassing aspects of their Facebook profile. Following a professor on Lore will also seem more natural because Lore is an opportunity to better education, and the student is interested more about the professor’s life as an educator (learning what other classes they are teaching, how long they have been teaching, what other colleges they have taught at, etc.) and less about their personal social life on Facebook. Lore is a place that showcases your education, where LinkedIn showcases your work, and Facebook showcases your social life. Lore effectively creates better relationships with classmates, friends, and professors, which was not possible from a social network while remaining in an educational setting. In conclusion, Lore is a great site which has made the educational side of social networking possible.